Johnny Appleseed's birthday will be celebrated on September 26th. To remember and get to know about him, we will be studying all about apples in the coming weeks. 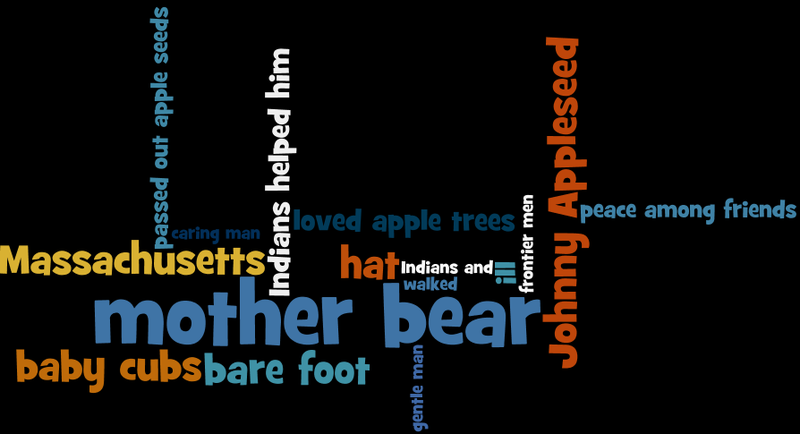 We listened to The Story of Johnny Appleseed by Aliki. We learned he was a real person by the name of Jonathan Chapman. He lived a long time ago. Johnny Appleseed gave people bags of apple seeds and planted apple trees all across America. 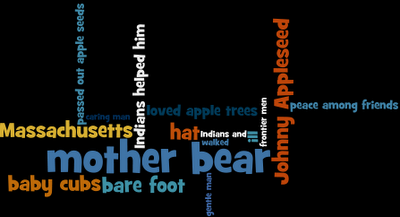 After we listened to the story, we shared thoughts about Johnny Appleseed through this Wordle. Monday, September 26th - Dress Alike with a K-1 friend/s. Pictures of Australia (food, places of interest, or people) are due. Wednesday, September 28th- Canned goods can be brought to school. Purple attire and crazy hair styles day. Friday, September 30th - Bring in a sandwich size baggie of snack food or cereal for the Trail Mix. This will be a buddy activity with Mrs. Conley's 3-13 class. Mix and match your clothing day. Friday, September 30th - Grandparent's Day confirmation form due. Friday, September 30th - Scholastic Book Orders due. I love apples! I can't wait to see your apple graph! Wishing all of you a wonderful Spirit Week! We're having a great time. Is your class having fun too?